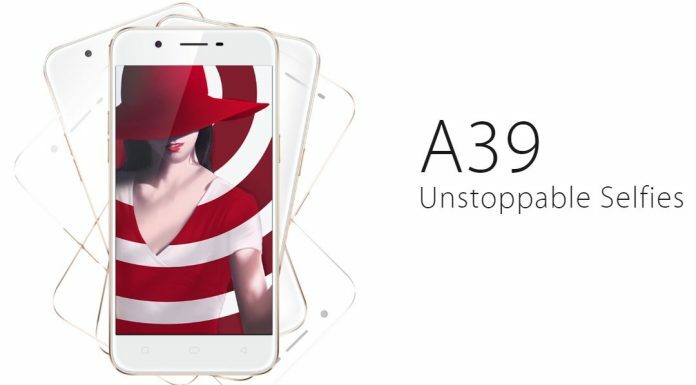 Oppo has come with a new 4G smartphone, named as Oppo A39. The phone is only available in Gold colour and is priced at Rs. 15,840. It seems to be an excellent competitor for mid-range smartphones. Though the hardware specs of Oppo A39 are very impressive, it lacks in software part, as it runs on Android 5.1 Lollipop. The phone is mere 7.65 mm thin and weighs around 147 grammes. Oppo A39 is equipped with MediaTek MT6750 1.5GHz octa-core processor along with Mali T860 GPU. It has 3GB RAM and 32GB internal storage which can be coupled with microSD card up to 256GB. It features a 5.2 inch IPS display which carries a resolution of 720 x 1280 pixels. It is a Dual-SIM phone with 3G and 4G support for lighting speed browsing and downloading. As far as the camera is concerned, Oppo A39 sport a 13MP primary camera with LED Flash. It also comes with a powerful 5MP front-facing camera. The phone is packed with 2900 mAh battery which can deliver 240 hours of standby time. Other notable features include FM Radio, Wi-Fi, GPS, Bluetooth and 3.5mm audio jack. Stay tuned with us to get latest updates on upcoming Oppo smartphones.